Frequent travelers often ask me for good snack ideas. I’m always happy to share: ditch the dreadful protein bars and pack bags of almonds and goji berries instead, for example. But imagine… what if… what if there was a yummy healthy snack you could make yourself in no time. So today we are going to get radical and in half an hour or so while you’re home, returning calls and dealing with the laundry mountain, you can make your own Scooby Snacks to take with you on your next trip. “No way. I’m far too busy. I barely have time to unpack and repack while I’m home.” Well, one of the reasons you work so hard is to enjoy your home. I have to assume that said home has a kitchen, quite probably a very nice one. I’m not asking you to make profiteroles. These crackers are really simple to make and I was even more impressed by the lack of residual mess. Throwing all the ingredients in a food processor and the use of parchment paper to roll the dough keeps everything really clean. As for the time factor, it took me 20 minutes to prep these, including going to the garden to get the rosemary and pouring a glass of wine to help the process. Ta-da! Ladies and Gentlemen, I bring you Savory Almond Rosemary Crackers, a lovely combination of protein and carbohydrate to keep you energetic. I wish I could claim the recipe as my own, but it comes from my dear friend and fellow health coach, the lovely Gina Knepell (www.NourishMethod.com). In the bowl of a food processor, add all ingredients. Process until smooth and dough forms a ball. Scrape sides of bowl and process again if necessary. Place dough between two sheets of parchment paper and roll out as thin as possible – especially in the center. Shape to fit baking sheet. Remove top piece of parchment paper. Transfer the bottom piece, with rolled dough, onto a baking sheet. Cut dough into 2-inch squares with a sharp knife and bake for 14 – 16 minutes, or until lightly golden. 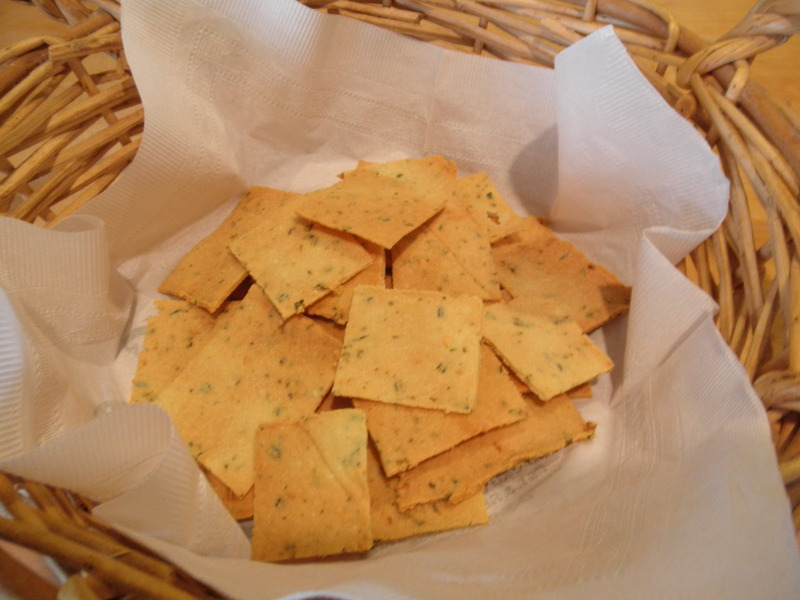 Let crackers cool on baking sheet for 30 minutes before serving. 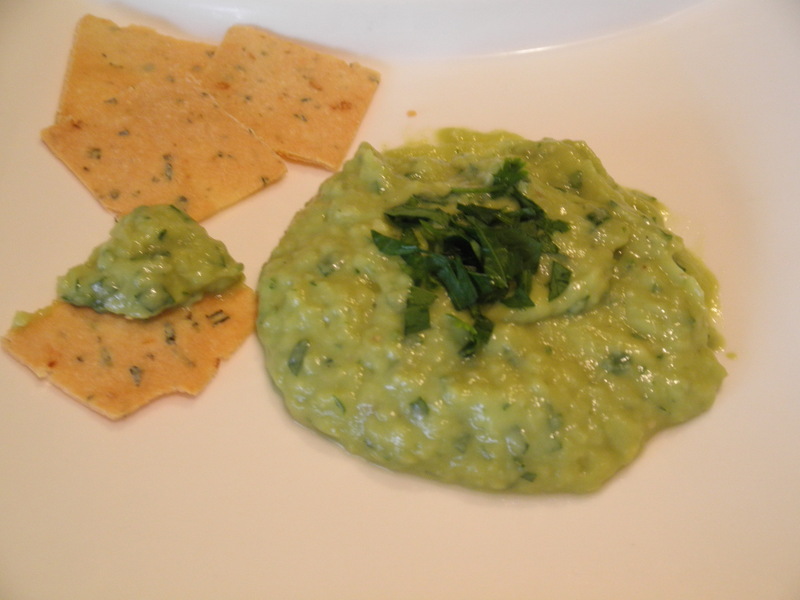 Here are the crackers with my delicious avocado puree. You can check that out in my previous post. My only concern with these crackers is how easy it is to eat all of them.